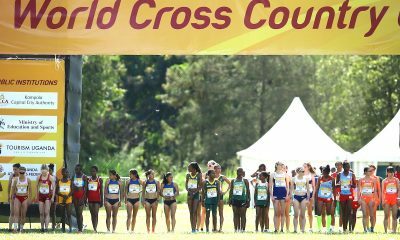 A fantastic bronze in the marathon at the Commonwealth Games practically went unnoticed as papers and websites rushed to type their headlines at the weekend. Of course, the brave run of Scotland’s Callum Hawkins, his welfare and the almost gold medal is important and of national interest, but so should the story of an unlikely recipient of a championship medal in the men’s marathon. 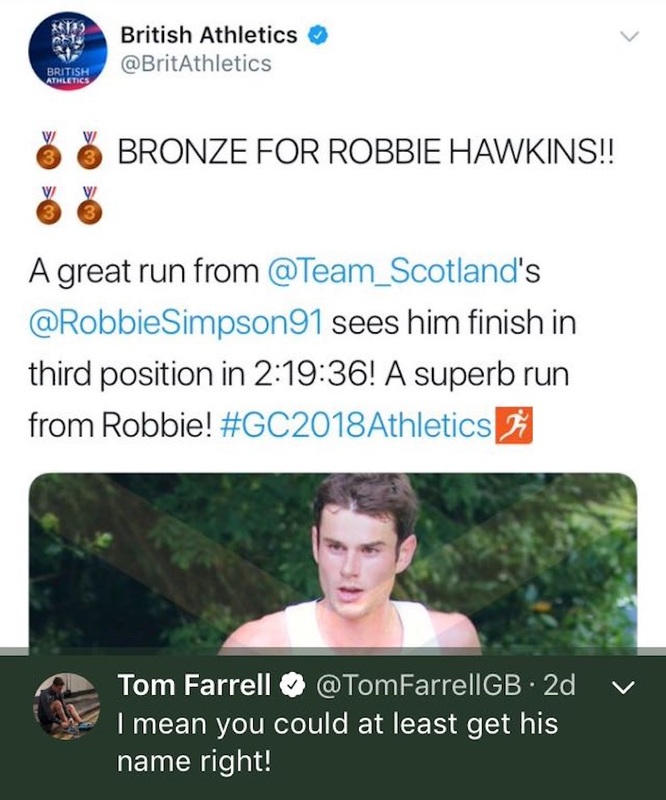 That performance of fellow Scot, Robbie Simpson, to work his way up the field to the bronze medal position is worthy of our respect and surely warrants more than a footnote? So what is it with us Brits and our adoration for ‘heroic failure’? Take a look at these British headlines: “Michael Shelly wins CW Marathon as Callum Hawkins suffers collapse”, “Leader Hawkins collapses a mile from end of marathon”. And one paper can’t even be bothered to find out the name of the runner in question: “Agonising moment British marathon runner collapses two miles from finish line”. 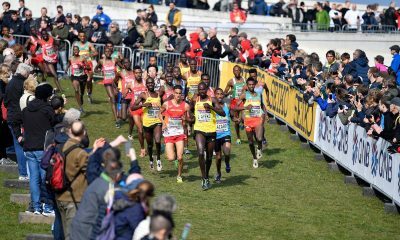 While not perfect either, but at least Fast Running went with: “Callum Hawkins collapses as Robbie Simpson bags marathon bronze”. When Hawkins dropped the lead pack at 30km, Simpson was back in 12th. All eyes were on the 60 minute half marathoner at the front. Ultimately only one of the runners was racing within their capabilities, given the conditions. Many will point out that Hawkins was going for gold and was indeed capable of winning. However, Simpson played it safer and might never have been in contention to win, yet walked away with a medal after judging the race superbly. 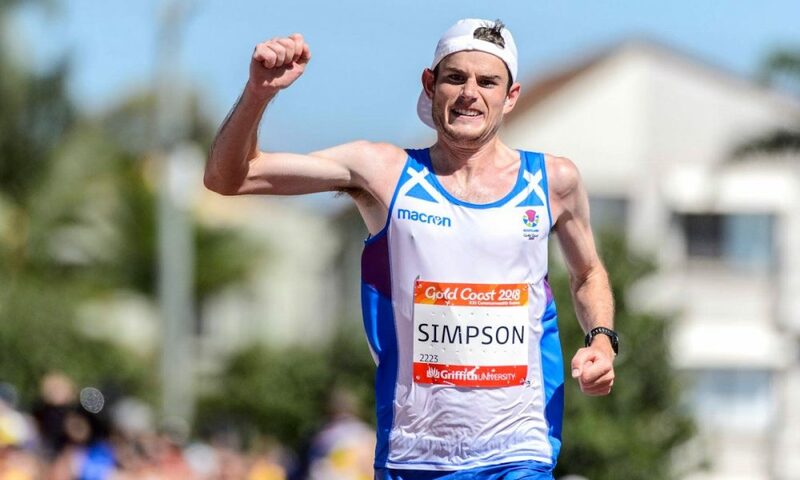 Simpson is a humble and hardworking individual, much like Hawkins, and better known as a mountain runner, but has also made a sterling effort on the roads in recent years. The Scotsman made the GB team for the World Championships in London last year, however, an injury derailed that marathon appearance alongside his compatriot. A runner that can medal at both the World Mountain Running Championships and a Commonwealth Games marathon is a rare thing. Even possibly the greatest ever mountain runner, New Zealander Jono Wyatt, only managed sixth at the 2002 Manchester competition. 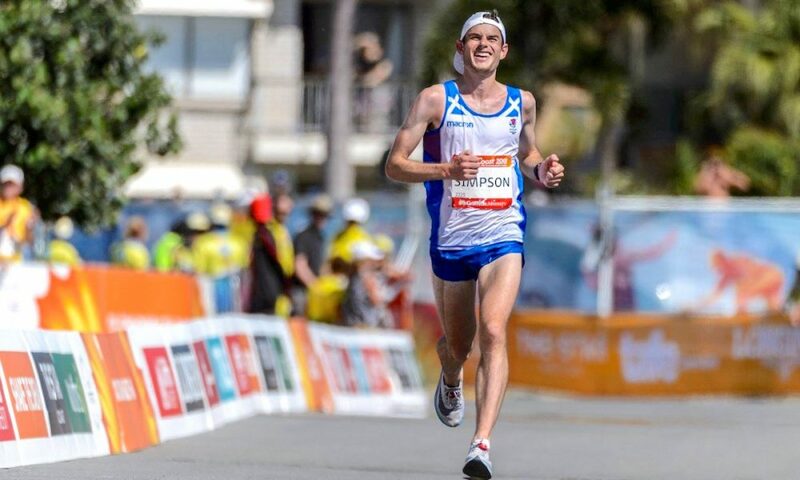 Whilst Wyatt finished sixth in a faster 2:14:20, when you take into consideration the conditions on the Gold Coast, Simpson’s 2:19:36 is the better result. Heat adaptation is not something usually associated with Scotland’s athletes, but toughness is. Hawkins ran himself to collapse in that heat. Less toughened athletes might have stopped or eased off, but he left it all out there, determined not to slow down. Is it this same toughness and a bit of racing know-how that enabled Simpson to advance through the field in the latter stages? This and perhaps his experiences in the mountains. While road and track athletes, and fans alike, are becoming obsessed with times, Strava, and PBs; in a mountain race, time doesn’t matter, it’s just you against your opponents, the terrain and conditions. 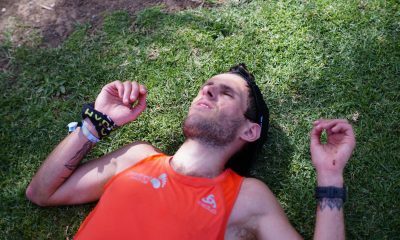 In the mountains, Simpson has experienced similar sweltering heat, running to exhaustion at events like the 31km Sierre-Zinal race. It may be shorter in distance than a marathon, but the net uphill means the winners are competing for over 2 hours and 30 minutes and it’s also at altitude. This experience, plus his toughness, meant Simpson was able to race excellently against everything he faced on the day. Yet the Brits, or just everyone in general, still love a heroic failure. “Better to have tried and failed, than never to have tried at all” one might say? Are we just celebrating the unsuccessful hard push for victory, not the strong, tough finish for third? How would it have been reported if it were the other way around? If Simpson had been the man in front, much like Yuki Kawauchi in the Boston Marathon on Monday, many would have said it was folly or poor pacing. So what even is the point of this article? Possibly just the desire to see a fellow Robbie get the praise he deserves for such a fine performance. I even got congratulated myself on Twitter, which was a little confusing. 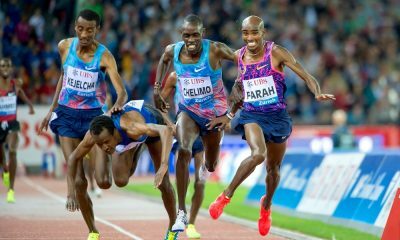 Hawkins ran bravely and deserves the plaudits for his attempt to win gold, that isn’t to be disagreed with. But Simpson showed composure, self-control and raced excellently to grab the bronze medal. Well done Robbie Simpson on a fine performance.